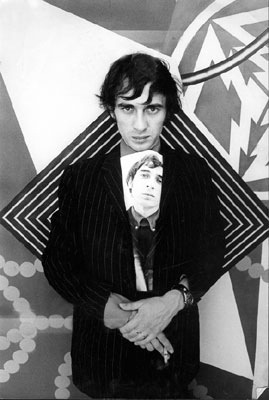 Image of Peter Phillips in the 60s, courtesy Whitford Fine Art. The other night I had the pleasure of dinner with Peter Phillips, the 73-year old who started his career firmly in the 60s as one of the original British Pop artists. He was featured in a documentary from the 60’s by Ken Russell, “Pop Goes the Easel“, and went to school at the Royal College of Arts along with David Hockney, Allen Jones, R.B. Kitaj, and has been making art ever since. That’s over 50 years of art making/doing/seeing/negotiating. There is something exciting and terrifying when talking to an artist with so much life and art world experience. Mostly because he speaks of the known, the obvious and the things one might enjoy being naive about at the start of one’s career. The topic of conversation ranged, but something that struck me was his comment about artists needing encouragement. The point was not made with great emphasis, but I heard it loud and clear – without encouragement artists can wilt. The other golden nugget of the evening was considering first hand the fact that if you make your mark as a “Pop” artist, or insert any other movement or style (e.g. collage, performance, video) – one risks being stymied. It wasn’t clear to me whether or not Pop really resonated with Peter now – and based on our political conversations he leans so far from consumerism these days that the mere thought of dedicating an art practice to the material seems off. On with the play, off with the Pop? It made me think of some other established artists such as Kara Walker who won a Catherine T. MacArthur Genius Grant at the tender age of 28. If she had not been so young, would she still be making silhouettes? Or could those silhouettes have dissolved to reveal a little more mess (albeit beautiful mess)? She draws beautifully and one won’t see her drawings on display as much, I’m thinking because of the pull of market and editorial expectations. Peter was very young when he was “discovered” as well. He was 23 at the time of the Ken Russell documentary. I can’t imagine what I would be doing today if I had received an Olympic-sized audience for portrait paintings I was doing in college (!?!). It’s curious to think about. I’m happy to be making my work now in a slightly marinated state and with a petit audience.